Atlanta Fed suspects oil bust, strong dollar. Despite President Obama’s emphatic assurances in the State of the Union Address that “our economy is growing and creating jobs at the fastest pace since 1999,” there have recently been some uncomfortable squiggles, so to speak. The collapse in the prices of oil, natural gas, and natural-gas liquids has started to make its imprint on the largest hydrocarbon producer in the world, namely the US of A. Oilfield layoffs and project cancellations are raining down on the oil patch on a daily basis. Suppliers are hit too. Many energy stocks are in the process of evisceration. Energy junk bonds are in a rout. But consumers love it – those who aren’t losing their jobs over it – because they spend less on fuel. Consumers are voters. So politicians love it because voters love it. Hence, it’s good for the economy. I get that. The ISM Purchasing Managers Index fell sharply in December, down for the second months in a row, but still in expansion mode. Other indicators piled on as well: on a national basis, the economy seems to be humming along and expanding, but at a slowing pace. 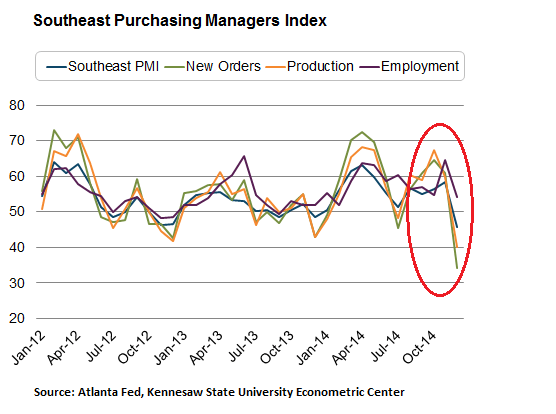 Then comes along the Southeast manufacturing PMI, by the Kennesaw State University Econometric Center, that the Atlanta Fed uses. It covers Alabama, Georgia, Florida, Louisiana, Mississippi, and Tennessee. And in December, it plunged 12.7 points to 45.6. Below 50. Not “slowing growth,” but an outright contraction. Decembers can be crummy in the Southeast, and these kinds of indices can be volatile, but this was the worst month since December of crisis-year 2009. New orders plunged a breath-taking 27 points to 34, blowing with some panache through the magic 50-point mark. Orders essentially evaporated; a harbinger for what might happen next. Production dove 19.8 points to 40, a steep contraction. Employment dropped 10.6 points to 54, remaining in expansionary mode. Supply deliveries fell 7.3 points to 50, the flat line. Finished inventory edged up 1.2 points, also to 50. Commodity prices dropped 10.4 points to 42, in contraction. Oil and gas weren’t the only commodities that were down. In December, the Commodity Research Bureau’s all commodities price index fell to 446, the lowest level since 2010 (chart), and down 22.6% from the index’s peak in April 2011. So there are some demand issues lurking somewhere. These “survey participants” are company executives. They’re paid to be optimistic. They have to forecast growth. No executive wants to manage a decline. This bias has infected all these kinds of surveys of executives. The Empire State Manufacturing Index, for example, always shows a much higher value for expected activity in the future than current activity. 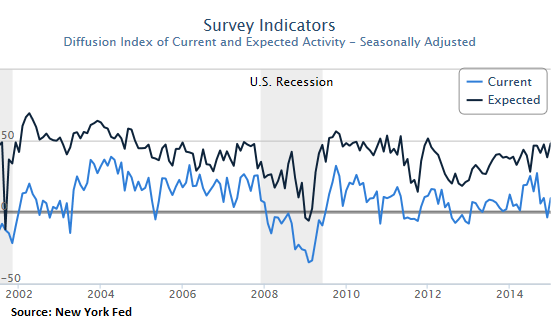 In December, the index for current activity (blue line in the chart below) was 9.9, where zero is the dividing line between expansion and contraction. In November, it had been below zero – in contraction mode – for the first time since polar-vortex January 2013. So these aren’t exactly heady times. But the expectation index was almost 50! The highest since January 2012. Current activity, a measure of reality, has never ever made it anywhere near that level. These folks expect an expansion of a blistering pace, even as reality is bumping along the bottom of an expansion. Note how expectations (black line) dipped into the negative only twice since the survey began in 2001, and only for the briefest moment, and only barely: on 9/11 and during the Financial Crisis. These folks are truly blind optimists, bordering on delusional, at least when it comes to these types of surveys! Even the New York Fed, which publishes the index, noted: “As has been the case for much of the past year, indexes for the six-month outlook pointed to widespread optimism about future conditions” – conditions that somehow never get anywhere near reality. And the Atlanta Fed’s optimistic group, which is expecting production “to be higher going forward,” is likely to fall into the same category. Or maybe both, in addition to a slew of other factors. Because these aren’t exactly rosy times. I believe China is massively contracting. It is likely the main cause of the rapid drop in oil and other commodity prices as demand crashes. Europe was skating on thin ice and the drop in China and Russian sanctions have tipped it over. So all of this is impacting US exports. I don’t know how much of the SE exports out but if only a small amount, this drop indicates how serious the world demand drop may really be. In the US, the whole driver now is the absurd level of apartment construction that continues as well as the mini-boom in single family that essentially is filling pent up demand from 2008 timeframe. In Charlotte, NC, every unfinished project is finishing, every scrap of close-in land is being built on (houses mainly) and there is an assortment of commercial building (mixed use, office, etc.) that has gone up. I see this drying up in the next 12-18 months as it runs it course. It is definitely not sustainable or probably even needed, but the banks with better balance sheets have caved and are making these loans. The apt building boom is well underway in south FL. A recent drive was surprising in the amount of new buildings that have gone up in the last year alone. Most of them looked empty. If the developers are looking for renters making 3x the rent they are going to have a long wait. Chinese managed to overbuild to a hilt whether it be roads, high speed trains, variety of mfg plants and lots of empty ghost cities. Money lent based on “connections” and of course made up or leveraged up many times collaterals. Corruption was at every levels. Alas, money borrowed do need to be paid back (!) all the while pledged collaterals are depreciating in value thanks to deflation. Next up is Chinese devaluing RMB to kick start the export business and WTO accusing Chinese of dumping steel, Al, cement, furniture, etc. all produced by overbuilt plants. They can build so many ghost towns and construction has already slowed down noticeably with many project in limbo due to dearth of financing meaning thousands of construction workers will be idle. Are you implying that they are,perhaps,……full of shooot? I’m one of the consumers happy with the drop in gas prices. The savings in the last three months are more than the increase in my family income over the last year. Sad, but consistent with what is going on in most families. My new found affluence took me to the 40% off sale at the local mall. A total Mad Max experience. Starbucks was packed. Outside were over half a dozen beautiful and expensive Japanese motorcycles, literally works of art. I almost got run over by a Maserati being driving by some college age boys. And I finally found a bargain at the mall. This gets me to thinking. After the last real estate bust, an awful lot of banks ended up owning houses and condos they had foreclosed. They didn’t want them, but couldn’t find buyers. They auctioned them off to speculators who intended to flip them at a juicy profit. As far as I can see, a lot of those speculator owned properties are still not occupied. We now seem to be adding apartment units to the stockpile of single family units. In addition, the car companies are making sales largely because of sub-prime loans whose maturity exceeds the vehicle’s life expectancy. It’s starting to creep me out. When this credit balloon pops, I doubt if even the Fed will be able to paper over it. Here in FL there are occasional articles about the houses the banks are still sitting on and can’t sell. 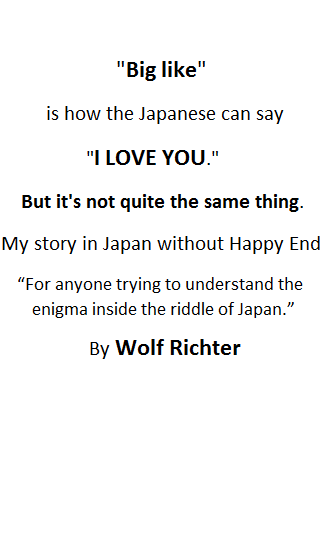 It is a hush hush type of story. For a long time they stopped foreclosures just to clamp down on the problem. The press doesn’t really cover it any more because they don’t want to depress prices. There seems to be a fear of finding the floor to the problem. P.S. The condo associations are buying their own foreclosures and renting them out just to keep the prices up in their buildings. There are a lot of rentals in these once exclusive condo buildings. They don’t even write about this in the papers.